YEARN FOR ALLAH: "Who has the strength to worship like 'Ali ibn Abi Talib!" "Who has the strength to worship like 'Ali ibn Abi Talib!" "By God, 'Ali ibn Abi Talib-may peace be upon him-never ate anything forbidden as long as he lived in the world, and never were two things wherein lay God's good pleasure presented to him without his choosing that which was more taxing of the two for his body, And never did the Messenger of Allah (s.a.w.) face any hardship without calling out to 'Ali (A), out of his trust in him, and none out of this Ummah except him has possessed the capacity, endurance and strength of the Messenger of Allah (s.a.w.). In his conduct, he would act like someone in trepidation whose face was between heaven and hell and who looked forward to the reward of heaven and was frightful of the punishment of hell. "Indeed, he set free in the way of God and for sake of deliverance from Fire a thousand slaves out of his own money, earned with the toil of his hands and the sweat of his brow. The food of his household consisted of oil, vinegar and dates, and his dress was never made of anything but coarse cotton, and if his blessed sleeves were too long he would ask for a scissors and cut them short. "Among his descendants and family no one ever came closer to resembling him in his learning and dress than 'Ali' ibn al-Husayn-may peace be upon both of them. His son Abu Ja'far (al-'Imam al-Baqir-may peace be upon him) once entered upon him and saw that he had reached an unprecedented state in worship. His complexion had paled due to keeping awake at nights; his eyes were sore from weeping; his forehead and nose were bruised due to prolonged prostrations; and his feet and ankles were swollen as a result of standing in prayer. "Abu Ja'far-may peace be upon him-said: `When I saw him in this condition I could not stop myself from breaking into tears. So I wept out of compassion that I felt for him, while he was sunk in contemplation. Some time passed after I had entered. Then noticing me, he said to me, "My son, give me one of those books which describes the worship of 'Ali ibn Abi Talib -may peace be upon him." I gave it to him. He read a little from it and then set it aside in exasperation. 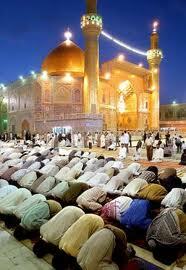 Then he declared, "Who has the strength to worship like 'Ali ibn Abi Talib-may peace be upon him!"'"